Charles-Dickens Elementary School was opened in 1971. In the 1992 school year the Europe School branch was added. The school is named after the famous author and philanthropist Charles John Huffam Dickens (1821 – 1870). 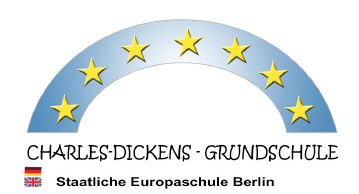 Charles-Dickens-Grundschule has both an English-German Europe Branch and a regular German Branch. The school is located between the Olympic Stadium and Berlins’ Grunewald forest, with very convenient connections to the public transportation system. A third building was added to the spacious school grounds in 2007. The 450 students at Charles-Dickens-GS have access to a well-stocked English-German library, 2 well-equipped computer rooms, a students’ kitchen, a large cafeteria and a huge green playground.